Happy Thursday, everyone!! I wore this outfit earlier this week and my top, my cardigan, my jeans and my shoes are all from the Nordstrom Anniversary Sale! The sale opens to the public tomorrow (yay!!!!) and be sure to check my blog tomorrow because I’ll be taking you inside my closet to show you my latest buys from the sale! Thanks so much for stopping by, I hope you all have a wonderful day!! Love this look, it’s perfect for pre-fall. Beautiful as always! Love the slides! I’m loving this casual style! And it definitely looks comfy and cute! Only you can make a jeans and T-shirt looks like so adorable. 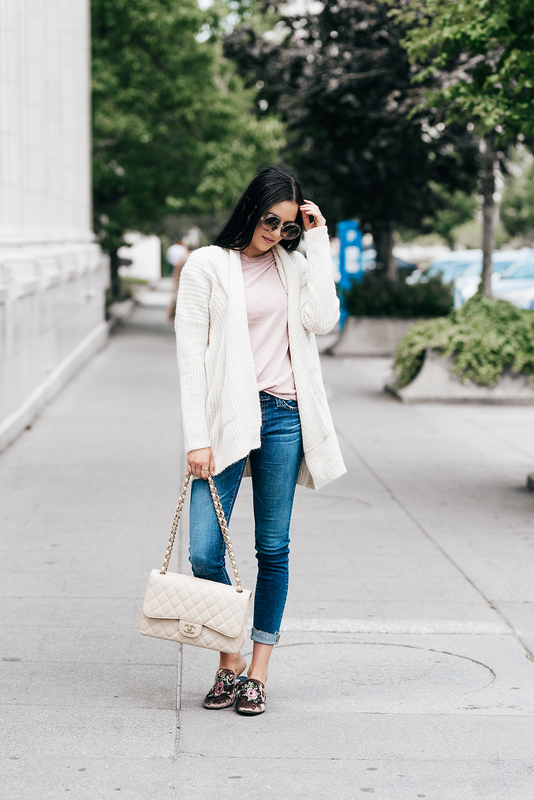 Such a cute and cozy cardigan!! Perfect outfit for transitioning to cooler weather! I love that blush tshirt! this casual look is so cute! Your cardigan and flats are fabulous!!! I like this casual combo very much! I got a similar cardigan in the sale! I also love that tshirt… so pretty! I feel like this sale is taking over my life and I’m not even mad about it :). How are you wearing jeans and a sweater in the summer?? Cute, but no way I’m wearing that for months! I love those mules in the bee print, so cute and such a fun way to add some personality to a basic look! I love your bag and those sunnies!!! Love the casual look! They’re my favorite, especially now with my 8 months old daughter.